A boy and his helmet. I think this picture says it all. It went well. In fact, he doesn’t seem bothered by it at all. He’s been such a trooper considering he also CUT HIS FIRST TOOTH TODAY. I can hardly believe it. Last night I called my mom and told her he had what looked like a canker sore on his gum. She said it’s probably his tooth getting ready to break through. Sure enough it was. Oh, and I almost forgot something amazing; the monster takes a bottle now! Woo-hoooooo! He is so super-fantastic-awesome. High-five, Max. You’re the best. Can I ask you where you got the helmet? Is it from Cranial Tech? 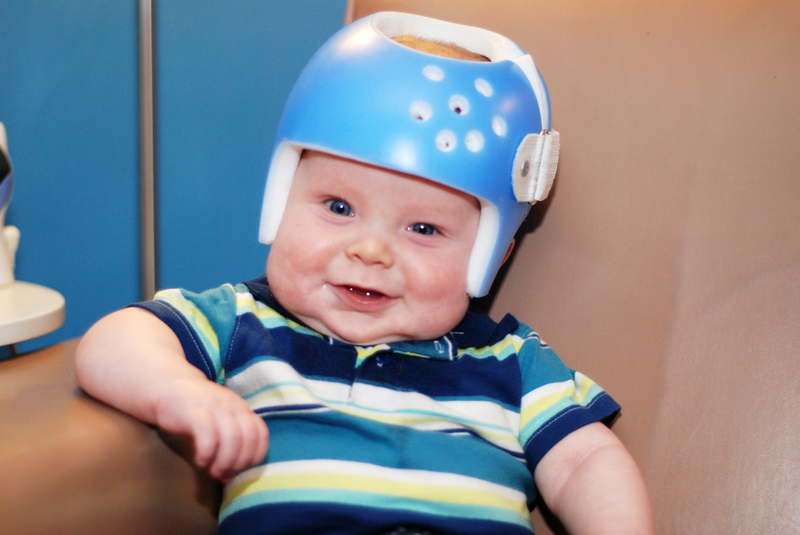 My son was in a helmet for six months. Interesting time for sure. Just so you know it definitely does help. My son ended up needing two helmets because we had some problems with a rash and he ended up out of the helmet for a while, but so far he’s doing good. He has been out of it for over a year and a half. Good luck!